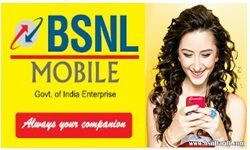 State run Telecom Company Bharat Sanchar Nigam Limited (BSNL) a Public Sector Unit and Largest network in India running affordable rate Telecom Prepaid Mobile plans under GSM mobile services across Kerala Telecom circle. Kerala Circle know to be highest revenue generating State for BSNL Organization in India. Maximum number of Mobile users are connected to BSNL connections with cheapest mobile prepaid plans like Freedom, Students plan, Mithram, Per-second, Per-minute, Pyari Jodi and Jai Jawan.